The Library and Archives Canada blog had a post called “Newly digitized microfilms on the Héritage portal.” There is a long list of fonds and records that have been added to the Héritage website. They have already got 255 records on the website. Some of these records may seem unrelated to family history but go in and play with the website and see what you can find. I did a search for a town and found a lot of references to diamond wedding anniversaries and requests from the King for acknowledgement letters. You can do a search for a term or word and when the results come up you don’t have to go into each collection. You can click on the image number and be taken directly to the image. 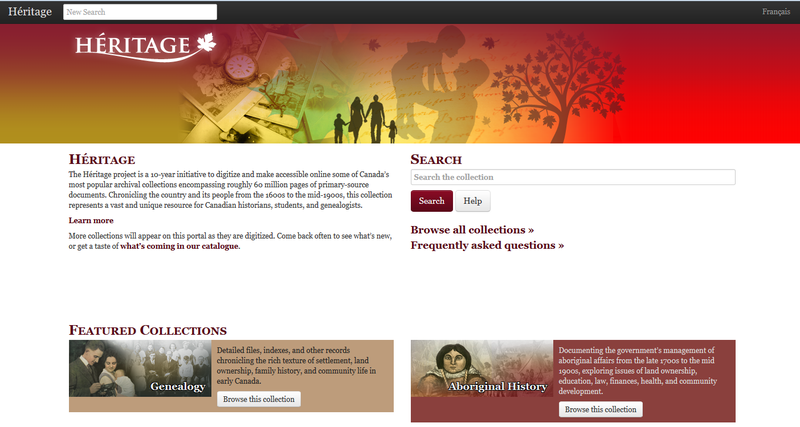 They have five featured collections which include: Genealogy; Aboriginal History; Government Documents; Military History and Landmark Papers. There are 65 results in the Genealogy Collection; 30 in the Military History; 11 in Aboriginal History; 108 in Government Documents and 123 in Landmark Papers. They have a Catalogue page and it provides you with some information. The most important note is that the number of films in the complete collection is more than 35,000 but the number of films described in the catalogue is 19,941. It has each of the collections in the featured collections listed. Under Genealogy Collection it provides you with a description of the record, the number of films, the number of pages by the 1000s (if 15 is listed then it is 15,000 pages), whether or not it has significant genealogical content and Mikan number. It would be nice if they had the titles hyperlinked so that they would be easier to find. There are 41 different parish registers listed including a few Catholic ones from the United States. One of the new parish registers listed in the LAC blog post is “Parish registers: Newfoundland, Labrador and Nova Scotia.” A search was done for “Parish Register” and there were five results with only one that was for an actual register. A search for “Parish Registers” provided nine results, two of which had Parish registers in the title. One of the results was for “Ste-Anne de Restigouche P.Q. Parish register” but it is under the title “Parish Registers Nova Scotia: C-1449.” Now Ste-Anne is in Quebec and not Nova Scotia and the About Section does not clear this up. I went into the digital images and the cover page says Registre de la pariosse Ste-Anne de Restigouche, 1759-95” and it has “N.S. Church Records – Acadia – Divers Registres 1755-1799” so this is where Nova Scotia came from. In the About Section it says that there are 177 pages for Ste-Anne and on the cover page of the microfilm it says that Ste-Anne has 158 pages and N.S. Church Records has 174 pages. The very first page of the registers is for Ste-Anne and the last page (page 177) is for N.S. Church Records, so they must all be included. The images are double pages. Why is N.S. Church Records in the title and not in the About Section of the record description? Don’t just rely on the record descriptions go into the microfilm and see for yourself what may be on it. One of the parish records collections was “General Index to the Public Archives of Canada: H-1317” and here you get an index card to a parish register of Lochwinnoch Presbyterian Church in Ontario. This can be very useful in determining what is available for your area of research. In a way this is a mix of old research and online research. You have to search the microfilm to find out what is on it but you can do it on your computer at home.